Protective – If a tooth is weakened from decay, cracked, or fractured, a dental crown can protect the tooth from further damage. Functional – If a tooth is broken or severely degraded and unable to be used for chewing, a crown for that tooth can restore it to full use. Aesthetic – Have discolored or misshapen teeth due to deterioration or damage? A dental crown can provide the appearance of a healthy tooth. The material choice for dental crowns can be determined by the purpose of the crown being placed, one’s budget, and aesthetic choices. Metals (Gold) – Crowns made of metal can incorporate gold alloys, palladium, nickel, chromium, and more. Metal dental crowns are more visible, but are a common choice for back teeth due to their strength and longevity. 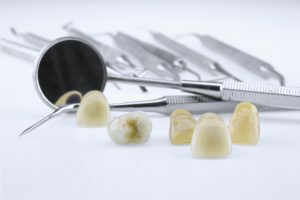 They are the most durable crown material to utilize. Porcelain – Porcelain crowns can either be a layer of porcelain attached to a metal base, or a full-porcelain crown. Porcelain allows for the tooth crown to be ideally matched to the natural color of your tooth. If a Temporary Crown is required, it is normally fashioned out of acrylic or stainless steel. It is then applied by one of our dental experts until a permanent one is ready to be placed. Restorative – Weakened or damaged teeth can be restored to full functionality. Preventative – Crowns are able to block further deterioration to teeth that have already been cracked or broken. Durability – A dental crown is a strong, long-lasting dental restoration option. In need of a dental crown, contact our dental clinic in Eagan today to schedule an appointment!